Stephanie and I waited until after the New Year’s weekend to head up to Chiang Mai, hoping to avoid the crowds of Thais who would be up there in the search of cooler weather. The crowds of foreigners might be lighter, too. What we found surprised us. Chiang Mai was deserted – no exaggeration, it was mighty lonely up there. I spoke with several locals and the story I heard again and again was that this is the least busy they’ve seen things in many years. Granted, the economy is bad and two years ago the airports in Bangkok were shuttered for a week as part of political protests. Still, with the great value that Thailand offers and the nice weather in Chiang Mai, I was surprised at how quiet things were. Things got off to a slow start as after boarding, we pushed back and fired up our engines only to be towed back to the gate because of an indicator light. After ten minutes of poking around we pushed back again, only to be returned to the gate. The pilot, an American, came into the cabin and apologized for the delay and indicated that they would have to have a closer look at something related to the oil system. We disembarked and waited about forty-five minutes until given the all clear. Above, a mechanic with a box of oil working on our engine. Chiang Mai started out sunny the first day with temperatures not too much cooler than Bangkok’s but at least a bit less humid. Stephanie and I stayed at the Imperial Mae Ping hotel, one of the original high-rise hotels in the city but thanks to a remodel and the fine service of the staff, still a very nice place to stay. Considering we paid just US$40 a room in the midst of high season, it was a steal. There are countless temples in the heart of the city, which is very walkable. We stopped by several of them, taking pictures and talking with people. Everywhere we went, people assumed Stephanie was the Thai and would speak to her, only to be confused when I would be the one responding to the questions as she looked at them with a polite smile and blank expression. At one temple, the patriarch of the temple, a saffron robed man in his eighties, was sitting in a plastic chair managing the work of several young monks. He waved me over and we chatted for several minutes. He was selling me on the unique attributes of his particular monk and an upcoming ceremony they would have. “Come back and see it!” he said as I bid my farewell. This entry was posted in Uncategorized and tagged Chiang Mai, Thailand by christao408. Bookmark the permalink. The sky was nice and pretty indeed, good angle of the temple! Was the flight up to CM not full at all? Wow that is a steal!!! 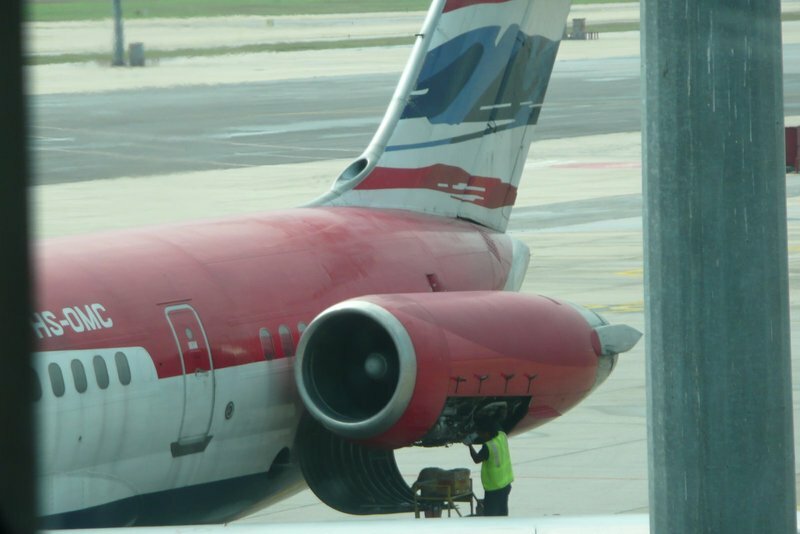 What airline is that? I don’t recognize it…? $40 a night, that is a bargain. Will you go back to watch the ceremoney? The assumptions people make based on looks… there is a reason my mother repeated endlessly “never judge a book by its cover”. I have the same question as Michael. My jaw just dropped reading about $40 a night. I wonder what the cheap hotels are charging. The second snap is so beautiful! Eagerly waiting for more! I’d love to go to Chiang Mai!!! I’ve heard that it’s beautiful. You really were fortunate, both, in the absence of the jostling crowds and the hotel accomodations. I would have loved to go there, just to shop for hand made souvenirs. @CurryPuffy – The flight was about half full. Interestingly, they packed everyone into the front half of the plane (up to the emergency exits) and left everyting behind it empty. Easier to clean up afterwards, I guess! @arenadi – One-Two-Go operated by Orient Thai. @ElusiveWords – Cheap hotels? Probably down to $5 a night at the really ratty places. @stevew918 – Probably not as it is the same ceremony that is held at all the temples. People come and light candles and walk around the chedi three times while praying. There’s an entry about it (and video) here. @murisopsis – Well, given two travelers, one a white guy and the other an Asian woman, in Thailand the odds would be in favor of the woman being Thai. @Dezinerdreams – I have some video I want to try to pull together today before doing the second post. Will see if I can get to it. 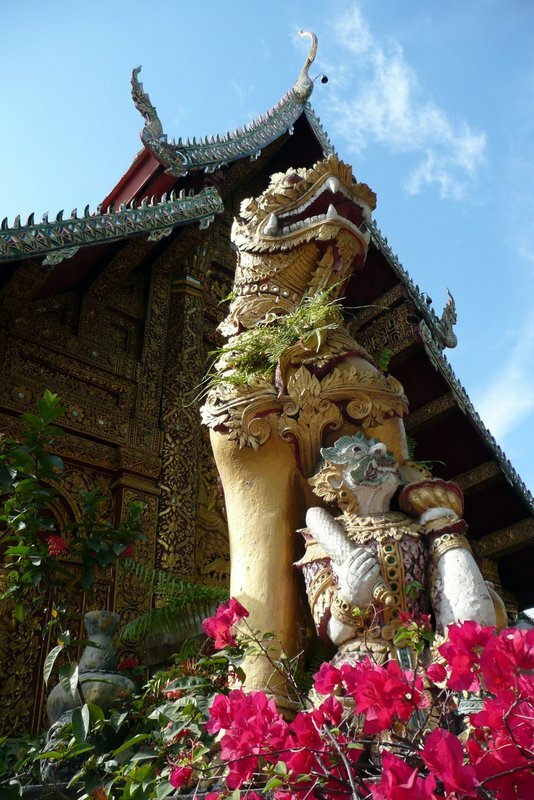 @TheCheshireGrins – When you guys get here, please include Chiang Mai – and more importantly, Chiang Rai and Mae Hong Son. @ZSA_MD – @lcfu – Oh, no shortage of souvenirs at the night market! @yang1815 – It is pretty amazing, isn’t it? @yang1815 – Yeah, Thailand is an especially good value in this economy. You and Sugi should really consider a stop here next time you’re over. i had no idea you speak thai. i would probably make the same mistake if i were a local there. @christao408 – We will when we are planning our next trip back home. :)Maybe you and Tawn can come to TPE one weekend and Sugi and I can come another weekend haha. @rudyhou – Indeed I do. Read and write, too. @yang1815 – Country swap! wow, good for you. this means you probably have lived there for years, huh?